Kids love straw toppers (the truth is, even some “big kids”, ahem… think they are fun!). These super easy star straws are a simple craft to let the kids create when they arrive at your 4th of July barbeque. All you need are cardstock or heavy decorative papers in a variety of patriotic patterns & colors, a medium-sized star craft punch or die cutting machine and star die (or even star cookie cutters to be traced) and a small hole punch. If the kids attending the party are younger, you can pre-punch or die cut all the stars and just put them out and let the kids stack them onto fun red, white & blue straws. If they are old enough to work with a craft punch, trace and cut out, or even use the die cutting machine, let them explore their creativity and cut them for themselves. 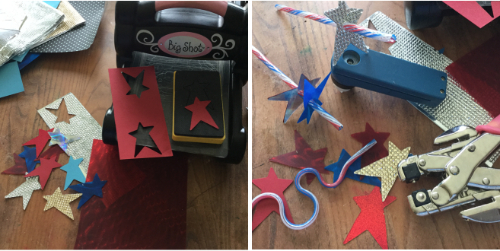 I used a Sizzix® star die for my stars. I also used two sizes of hole punches – as one set of the heavy duty plastic straws was smaller than the other and I didn’t want my stars to slip down into the beverages – you want them snug enough to stay put on the top section of the straws. These stars were given a bit more “patriotic sparkle” because I used a variety of shimmering red & blue Rowlux® Illusion Film, Graphix® sparkling plastic film, and self adhesive shining faux rhinestone sheets from The Buckle Boutique (the last two were mounted to cardstock star bases since they are self-adhesive).